I don’t often travel for the holidays, but this Christmas, Vegas beckoned. My partner’s mother and her husband moved to Las Vegas earlier in 2018, and we were overdue for a visit to see them. The key to this plan was a flight back to Chicago on Christmas day—much cheaper—and in short, that’s how we ended up leaving the family Christmas late on the 24th and heading back to our hotel room before going to a bar on an observation wheel. Reader, it was terrific, both as an experience and a value. Cannot recommend it enough. 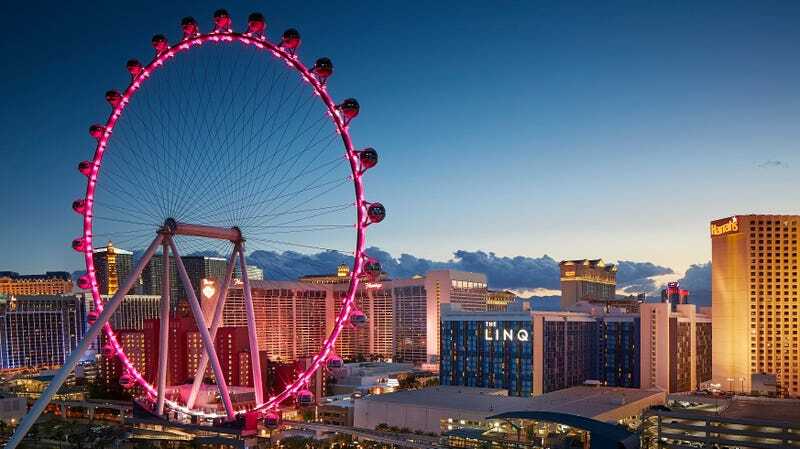 I’ll admit, I had my doubts about the High Roller at The Linq Hotel, which Caesars Entertainment calls “the world’s tallest observation wheel.” I love a good scenic view (who doesn’t? ), but the idea of being trapped in a small enclosed space with a bunch of people doing the whole all-caps VEGAS thing did not immediately appeal. Admittedly, my experience was probably less cramped than it might usually be, given the time of my visit, but I’d do it again, even if it were packed. We purchased “Happy Half Hour” tickets, which include an open bar for the duration of the single 30-minute revolution. My doubts extended to whether or not those tickets would be worth the increase in price—how many drinks can you reasonably consume in 30 minutes, especially when there’s only one bartender and plenty of other people hoping to get their money’s worth?—but those, too, were ill-founded. Our bartender, an Arkansas Razorback with a delightful twang, told our group upon entering his “cabin” that he prided himself on being able to get a drink in everyone’s hands in the first three minutes. He did just that. After that, the atmosphere was incredibly congenial. No one was pounding drinks, as the pours were very generous, so instead we took pictures of each other, chatted about our lives and about slot machines, kept watch to see if the Bellagio fountain would start fountaining. Had there been another 10 minutes on the trip, odds are we’d have started singing Christmas carols—and that is not an exaggeration. It was lovely. At the end, our bartender rushed to get everyone who wanted one last drink, and nearly everyone threw a big ol’ tip in the jar. There was a toast, and applause, and everyone left beaming. It was so holly and jolly, it probably seemed insufferable from the outside. If someone had stood on the platform, selling tickets to go right back in, I’d have bought one in a heartbeat. While there are other giant Ferris wheels with drinking and/or dining options, I found only one, the Icon Orlando, that has does the same sort of happy hour ticket option. Big ol’ wheels of the world, take note! A Ferris wheel bar (enclosed, obviously) can be a magical thing, provided you’ve got smart, efficient bartenders (and someone there to turn the already-drunk folks away). Because drinks are so expensive elsewhere, it’s a great value for the rider. Because you’re buying beer, wine, and spirits in bulk, it’s presumably a great value for you, too. And the experience, which turned a trip on a tourist attraction into a Christmas Eve cocktail party, was one I won’t soon forget. Tip your bartenders, they’ll be there all night.